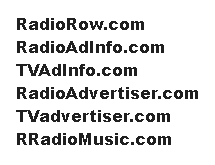 European Broadcasting Union is starting to sell the top level domain name ".radio." Anyone in broadcast or online radio needs to focus on what's ahead, and not jump into what may become a bad decision. By "top level," we're talking about the suffixed part of a domain: .com, .org., .info, .gov, etc. Since the internet's beginning, there's been a rather limited number of names. Some of the catchiest, shortest, most easily understood ones fetched high prices. Radio.com, owned by CBS (which acquired it with purchase of CNet!, but didn't use it for CBS radio listings until after 2009). I could list a few more from the streaming side, but anyone want to suggest another from broadcast? If it exists there's not been mention of it in trade publications. If you think iHeartRadio.com should be listed, count how many letters are in its name and then think again. It's this too many letters concept that makes the ".radio" TLD problematic. In a world where attention spans and degrees of work required both lean short, why would you want a name that, online, a person would have to do more work to access? ".radio" is not an ideal top level domain, in part, due to the two extra characters needing to be typed. Add to those whatever name you've chosen to precede the "dot," and you could be facing a consumer having to type 12-15 characters to gain access. That's not a positive in the world of user-interface. Also, think about the degenerating relevancy of the term "radio" to those under 40. The other question to the efficacy of .radio is one of economics. I pay $15 a year for each of the multiple .com domains owned. In Euros, the cost for .radio may run from 220 ($262/US) to 250 ($298/US) annually. It could even be more than that as this test of purchasing "my.radio" shows: 1) I'm first shown that it's "possibly available." What does that mean; 2) Upon advancing in the sales process, I'm told EBU will notify me by email when it has determined the date and price of when this particular domain is available. Purchasing a .radio domain could end up being a drain for one more reason that you may consider after this thought: Once you get a site developed on .radio, you'll be waiting years before the public is ready to think about shifting its habit from using .com, .org., .info, .gov, etc. This is called "path dependency," and it's the reason the U.S. is still using feet-inches as measurements instead of the simpler metrics system (which we tried to shift to in the 1970s). You just don't change a society's direction overnight. Give "Go Out and Play" a listen.